Thee Optimist: What's the best black tea in America for the price? It's a surprise. Trader Joe's. You're a tea drinker, aren't you? Yeah, me too. I started drinking tea when I was four years old. And when I say "tea," I don't mean herbal sleepy boo boo bedtime tea. I mean strong black tea, colored with artery clogging whole milk. People say it's good for you. People say it isn't good for you. Who cares? I'm a freak about tea. I've had many thousands of cups of tea over the years, and I must have tried two dozen different brands. This makes me an expert. For many years, I drank Lipton tea, and sometimes Red Rose. These are okay brands of tea, but really no more than that. At some point, on a trip to Ireland, I drank Barry's Gold Blend for the first time. Uh-oh. That's really good tea, waaaay better than Lipton. Except this was the early 1990s, and you couldn't find Barry's Gold Blend anywhere in the United States, and it was really too expensive when you could. 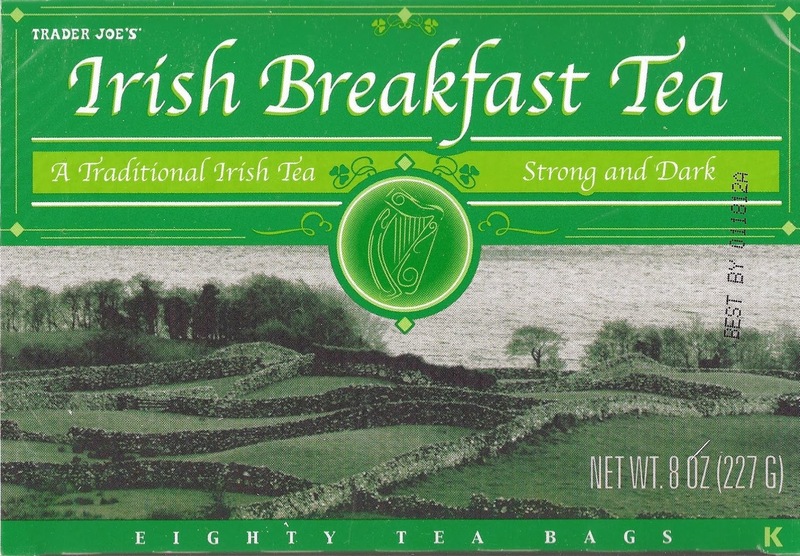 Over the years, people I knew turned me on to other brands of tea, including Lyons tea, also from Ireland, PG Tips from England, and Twinings, also from England. 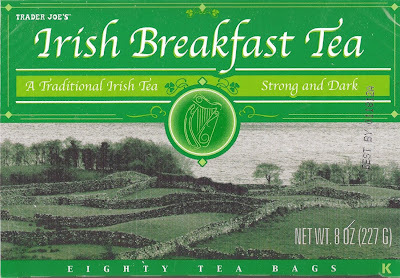 The Twinings Irish tea, in the green box, is the one that packs the punch. If I had to rank them, I'd say Barry's Gold Blend is the best, followed by Lyons (careful - Barry's vs. Lyons is a source of controversy in Ireland), followed by PG Tips, with Twinings a distant fourth. But they're all very good teas, much better than American brands. And in recent years they've become more and more available in American supermarkets. Now, with Amazon.com, they don't even have to be available in your supermarket - you can buy them whenever and wherever you want. The only problem? They're still too expensive. How expensive? Well, my sister the millionaire calls Barry's Gold Blend her "guilty pleasure." 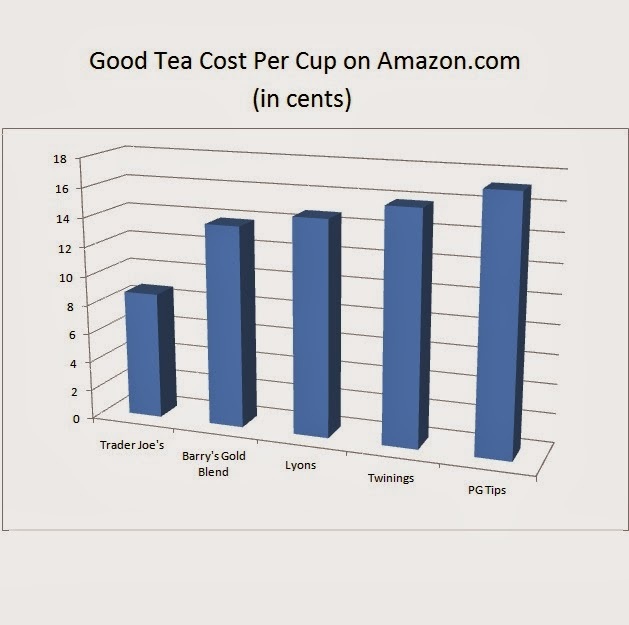 On Amazon, a box of 80 Barry's Gold Blend tea bags will run you $11.09. The same 80-count box of Lyons tea will run you $11.79. An 80-count box of PG Tips is $13.75. Twinings tries to confuse the issue, and will sell you a 120-count package for just over $19.00. We're not as dumb as we look, though, and we can easily see that the prices range from about 13.8 cents a cup for the Barry's, to 15.8 cents a cup for the Twinings, to 17.2 for the PG Tips. These are markups of about 10-20% above the supermarket prices, but not everybody can get these brands at their local supermarket. Strangely, the Trader Joe's tea is about as good as Barry's Gold Blend or Lyons, better than PG Tips or Twinings, and is much less expensive. I don't know where they grow this, or if Barry's and Lyons "lose" a few truckloads of tea each week that find their way into this box, but it's all I drink at this point. Thanks for this thoughtful guide on tea bags. You are truly a master in your field. I agree 💯. Drinking a cuppa as I write this. Really enjoyed your post. Thanks Ms.J. Very kind of you. I'm about to have a cup of Trader Joe's black tea right now.